Darwinzon Hernandez does not have any MLB stats for the season. Full name is Darwinzon David Hernandez Afanador ... First name is pronounced "DAR-win-zin" ... Signed by Rolando Pino and Ramon Mora (Red Sox). Went 9-5 with a 3.53 ERA (42 ER/107.0 IP) between High-A Salem (23 GS) and Double-A Portland (5 relief appearances) ... Allowed only 1 HR, including 0 in his final 65.2 IP ... Among the 602 minor leaguers who threw at least 85.0 innings, owned the 3rd-lowest HR/9.0 IP ratio (0.08) and 16th-highest SO/9.0 IP ratio (11.27) ... His ratio of 134 SO/HR was the largest in that group ... Did not allow a HR to any of his 140 left-handed hitters faced (24-for-111, 42 SO, 18 BB, 10 HBP, 1 SH) ... Entered the season ranked by Baseball America as the Red Sox' No. 6 prospect, as well as having the best fastball in the Sox' minor league system ... Began the season at High-A ... His average of 11.05 SO/9.0 IP while with Salem ranked 1st in the Carolina League (min. 70.0 IP) ... On 7/8 at Potomac, allowed 0 hits and recorded a career-high 10 SO in 5.2 scoreless innings (5 BB, 1 HBP) ... In his final 8 starts with Salem (7/3-8/17), went 6-0 with a 1.29 ERA (6 ER/42.0 IP) and a .197 opponent AVG ... On the 7-day DL from 8/5-16 with a left pelvis strain ... Transferred to Portland on 8/22 and spent the rest of the season with the Sea Dogs as a reliever ... Following the season, made 8 appearances - all in relief - for Mesa in the Arizona Fall League ... Posted a 1.59 ERA (2 ER/11.1 IP), allowed 0 XBH, averaged 19.06 SO/9.0 IP, and struck out 24 batters while walking only 6 ... Also played in the Fall Stars Game on 11/3 and faced 2 batters, allowing a single and recording a strikeout. 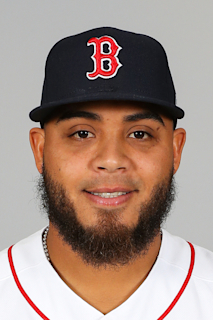 March 23, 2019 Boston Red Sox optioned LHP Darwinzon Hernandez to Portland Sea Dogs. November 20, 2018 Boston Red Sox selected the contract of LHP Darwinzon Hernandez from Portland Sea Dogs. August 22, 2018 LHP Darwinzon Hernandez assigned to Portland Sea Dogs from Salem Red Sox. August 17, 2018 Salem Red Sox activated LHP Darwinzon Hernandez from the 7-day disabled list. August 7, 2018 Salem Red Sox placed LHP Darwinzon Hernandez on the 7-day disabled list. April 3, 2018 LHP Darwinzon Hernandez assigned to Salem Red Sox from Greenville Drive. March 8, 2018 LHP Darwinzon Hernandez assigned to Boston Red Sox. July 3, 2017 Greenville Drive activated LHP Darwinzon Hernandez from the 7-day disabled list. June 13, 2017 Greenville Drive placed LHP Darwinzon Hernandez on the 7-day disabled list. June 7, 2017 Greenville Drive activated LHP Darwinzon Hernandez from the 7-day disabled list. May 24, 2017 Greenville Drive placed LHP Darwinzon Hernandez on the 7-day disabled list retroactive to May 21, 2017. April 4, 2017 LHP Darwinzon Hernandez assigned to Greenville Drive from Lowell Spinners. June 16, 2016 LHP Darwinzon Hernandez assigned to Lowell Spinners. February 21, 2014 LHP Darwinzon Hernandez assigned to DSL Red Sox. August 26, 2013 Boston Red Sox signed free agent LHP Darwinzon Hernandez to a minor league contract.